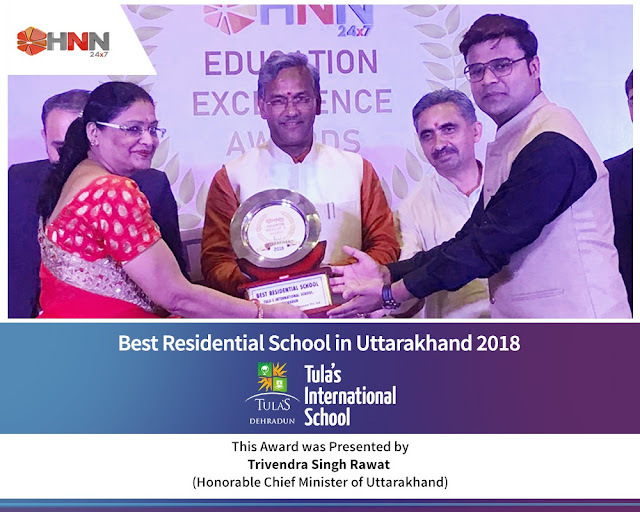 New Delhi 25 July, 2018: Tula’ Group, a visionary group of institutions dedicated to serving the community by recognizing diverse needs of the aspiring students and the individuals and Tula’s International School has been recognised as the ‘Best Residential Boarding School In Uttarakhand’ and Tula’s Institute has been awarded as the ‘Best Engineering College in Uttarakhand’ at the Prestigious Education Excellence Awards of India by HNN 24*7 for the year 2018. 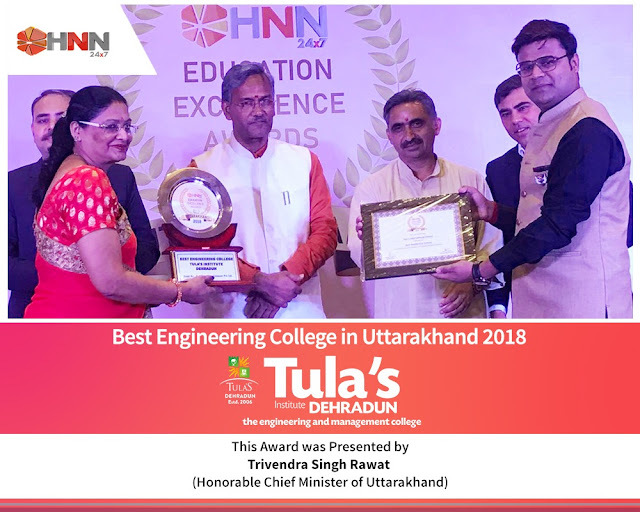 The awards were hosted on 17th July 2018 at Seyfert Sarovar Portico, Dehradun, where Senior BJP Leader, Mr Sunil Uniyal was the Guest of Honour and awardees were presented with a certificate and trophy of excellence by the Chief Minister of Uttarakhand, Mr. Trivender Singh Rawat to Ms Sangeetha Jain, Secretary and Vice President Mr.Raunak Jain of Tula’s’ Group. Tula’s Group of Institutions is set up by the Rishabh Educational Trust. It is located in Dehradun in Uttarakhand. Tula’s Group provides excellent infrastructural facilities with well-equipped Laboratories, modern computer center, spacious and well-furnished classrooms, seminar hall, library, workshop and Auditorium. They are dedicated to serving our communities by recognizing the diverse needs of individuals. We encourage personal and professional development through respect, appreciation and a commitment to general education, as a foundation for life-long learning.